Epitope specificity group B (ISOBM classification). Full length native protein (purified) corresponding to Human MUC16. Purified from human ovarian carcinoma. 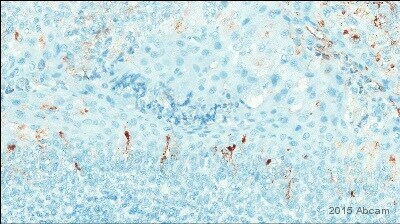 IHC-P: Human lung, benign ovarian tumor and bladder carcinoma tissue. Our Abpromise guarantee covers the use of ab10033 in the following tested applications. WB Use at an assay dependent concentration. Detects a band of approximately >1000 kDa. ab10033 staining MUC16 in human bladder carcinoma tissue by Immunohistochemistry (Formalin/PFA-fixed paraffin-embedded sections). Publishing research using ab10033? Please let us know so that we can cite the reference in this datasheet. what is the size band detected in WB? The predicted MW is so huge I don't know what size gel to use! 7. Staining by 0.05 % DAB, H2O2. Tween is added to buffers in each step. With crude antigen from cells as sample and MAb X75 a diffuse area on top of the gel around 200 kDa is detected. Unfortunately image is not available. We have used 6% or 8% gel. I was reading the data sheet and was wondering what epitope this https://www.abcam.com/MUC16-antibody-X325-ab10033.html recognizes. Do you know? I want to know I can use it to blot for a peptide that cooresponds to AA21005-21992. Thank you for your time and I look forward to hearing from you. Any one of these biomarkers is good for me. Thank you for your resposne. As my colleauge has explained in the previous e-mail, our antibodies and proteins will regrettably not have been tested and guaranteed in the application you are using (i.e. electrical biosensors). As ELISA is the closest application, I am pleased to recommend some antibodies suitable for this applications, however these will not be covered by our guarantee for electrical biosensors.